Bones consist of a matrix of hydroxyapatite (calcium phosphate) and other minerals embedded in a cross¬-linked collagen matrix. Its formation and maintenance is an ongoing, dynamic process. Till the age of 30 years, the process involves mainly bone formation, but after this bone formation and bone resorption develop a delicate balance. If bone resorption becomes dominant, it can lead to osteopenia (a forerunner of osteoporosis) and finally, osteoporosis. Osteoporosis is characterized by a decrease in bone mass and density, causing bones to become fragile and increasing the risk of fractures. Formation of new bone structure is promoted by Osteoblasts by increasing calcium content and osteoclasts, which play role in demineralization of old bone by releasing calcium into the blood circulation. Bone formation and resorption (bone remodeling) take place continuously in the entire skeleton. The concentration of calcium in the blood is maintained within very narrow limits using the bone structure as a reservoir. The hormone calcitonin promotes the transfer of calcium into the bones, while parathyroid hormone (PTH) promotes the release of calcium from the bones. The above process of bone formation requires an adequate and constant supply of nutrients, such as calcium, protein, magnesium, phosphorus, vitamin D, potassium, and fluoride. Other nutritional considerations include nutrients such as vitamin C and vitamin K that may reduce fracture risk by increasing bone mineral density as well as the improvement of bone micro-architecture. Milk calcium concentrate from milk provides calcium and phosphorus and is an ideal supplementation for osteoporosis and calcium deficiencies. Being from milk source, this is a 100% vegetarian supplement and additions of minerals and Vitamin D makes this product a supplement of choice. Milk calcium, a concentrated source of calcium and other minerals derived from milk. Besides calcium, it includes minerals important for bone growth such as phosphorus, magnesium, potassium, sodium, iron, and zinc. Phosphorus is needed for effective calcium absorption and bone repair. Researchers found that an increase in bone mass in pre-pubertal girls whose diets were supplemented with milk calcium lasted several years after the study even without further supplementation. An adequate intake of calcium is clearly essential in achieving and maintaining sufficient bone mass due to the simple fact that calcium, in the form of hydroxyapatite, constitutes the major part of the bone structure. In combination with vitamin D it is effective in preventing bone loss and fractures. About half of the total magnesium (Mg2+) of the body exists in bone. Bone is one of the main Magnesium pools in the body. Epidemiologic studies have demonstrated a positive correlation between magnesium intake and bone mineral density. It is also reported in a study that magnesium deficiency induced a decrease in osteoblasts number, an increase in osteoclasts number and a decrease in bone strength. In contrast, dietary magnesium supplementation improved bone formation, bone resorption and bone strength. 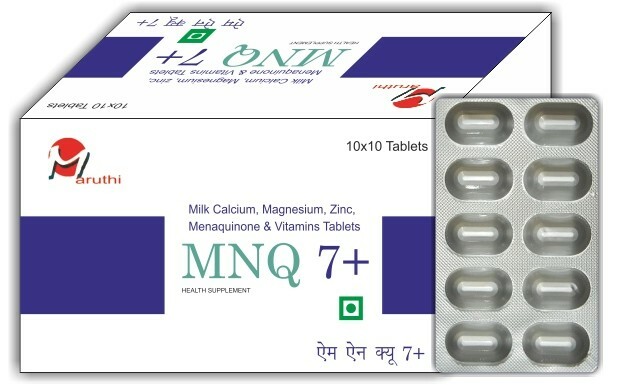 Magnesium also helps in producing an alkaline environment, reducing calcium excretion and thus improving bone density. Magnesium deficiency is known as a risk factor for osteoporosis, since it is essential mineral for normal bone growth. Vitamin C promotes higher bone mass and lowers fracture rates. It has a dual action on bone renewal. This happens because Vitamin C suppresses osteoclasts (bone-destroying cells) while it also stimulates the production of osteoblasts (bone-building cells). Vitamin C promotes healthy and constant bone renewal, critical to preventing fractures. Zinc is an important mineral that is required for normal bone development. It increases both the number and area of mineralized bone nodules. Zinc has biphasic effects on the differentiation and mineralization of human osteoblast-like cells. A low dietary intake of zinc and accompanying low blood levels has been associated with an increased risk of osteoporosis in both women and men. Vitamin D3 (cholecalciferol) is essential for maximizing bone health. Vitamin D3 enhances intestinal absorption of calcium and phosphorus. Season, latitude, skin pigmentation, sunscreen use, clothing and aging can dramatically influence the synthesis of vitamin D3 in the skin. This deficiency is very prevalent in osteoporotic patients. Vitamin D3 deficiency causes osteopenia, osteoporosis and osteomalacia, increasing the risk of fracture. Vitamin D3 deficiency causes muscle weakness, increasing the risk of falls and fractures. Patients being suffering from osteoporosis should be adequately supplemented with calcium and vitamin D3 to maximise the benefit of treatment. Vitamin D3 insufficiency is highly prevalent among postmenopausal women with osteoporosis and in the elderly. Supplements of vitamin D3 (cholecalciferol) may decrease falls and fracture risk by 25%. The hormone calcitonin promotes the transfer of calcium into the bones, while parathyroid hormone (PTH) promotes the release of calcium from the bones. Vitamin D is important in controlling PTH level with a deficiency leading to higher PTH concentration and subsequent demineralization. Vitamin K2 is produced by bacteria. It is present in high quantities in our gut, but unfortunately is not absorbed from there and passes out in stool. Vitamin K2 directs calcium to your skeleton, while preventing it from being deposited where you don't want it - i.e., your organs, joint spaces, and arteries. A large part of arterial plaque consists of calcium deposits (atherosclerosis), hence the term "hardening of the arteries." The main role of vitamin K is to act as a cofactor for the conversion of glutamate into gamma-carboxyglutamate, which, in turn, is involved in the synthesis of osteocalcin (produced by osteoblasts), the hormone that promotes bone formation. Osteocalcin also appears to help prevent calcium from depositing into your arteries. So while increasing calcium is good for your bones, it is not so good for your arteries, which can become calcified. Vitamin K helps protect your blood vessels from calcifying when in the presence of high calcium levels. Vitamin D helps your body to absorb calcium, but vitamin K directs that calcium to your skeleton where it's needed. Without the help of vitamin K2, the calcium that your vitamin D so effectively lets in might be working AGAINST you - by building up in your coronary arteries rather than your bones. The safety of vitamin D is dependent on vitamin K, and that vitamin D toxicity (although very rare with the D3 form) is actually caused by vitamin K2 deficiency. ●	tell your doctor and pharmacist if you are allergic to any of its ingredients. ●	tell your doctor if you have Diabetes or Kidney problem. ●	tell your doctor if you are pregnant, plan to become pregnant, or are breast-feeding.